One of the world’s famous mobile phone games developers, Distinctive Development has recently released Rugby Nations 09 for iPhone and iPod Touch users. 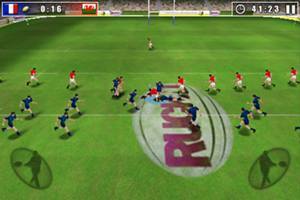 Rugby Nations 09 is an exiting arcade Rugby union game that has been designed to target rugby lovers. The game has been improved by using a combination of touch screen and accelerometer controls for gamers to pass, sprint, tackle and kick their way up the pitch precious inch by inch until they try or drop goal. Besides, the gamers also can control conversion kicks by a swipe of the screen that sets the power and directs the kick. With Rugby Nations 09, the gamers can enjoy playing the world’s three best tournaments and complete against ten of the best international teams. “I’m passionate about Rugby and so are millions of other fans around the World so it’s great to be able to help bring this iPhone game to those fans”, added by Will Carling. The Rugby Nations 09 is available at Apple App Store with the price of £2.99.